Located in the centre of O'Connell Street, Dublin's General Post Office (GPO) is one of the world's oldest postal headquarters. It is the administrative centre of the Irish postal service (An Post) and one of the most famous Irish builldings. It was officially opened on 6 January 1818. It was built in 1814 by Lord Whitworth and designed by Francis Johnston in a classical style. The buillding is famous for its beautiful architecture and is open to visitors. It has typical Greek features such as six Ionic columns, three symbolic statues of Hibernia, Fidelity and Mercury above a pediment, a central portico and a balustrade. Moreover it is a symbol of Irish nationalism. Indeed it was the headquarters of the revolutionary leaders during the Easter Rising (1916). The Easter Rising refers to the insurection of 1916 during which republicans claimed the end of the British rule and the establishment of the Irish Republic. 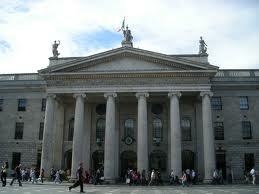 The members of the Citizen Army chose the GPO, the centre of Dublin, as the building to claim the Irish independence. Because of the British attacks the buillding was damaged and it was later rebuilt in its original location, after the independence of Ireland was proclaimed. It was officially reopened in 1929, with the architecture we know today. Nowadays, the GPO building is still remembered as a symbol of Irish nationalism. Inside the building we can see the statue of the Irish warrior Cuchulainn, in remembrance of the Irish people who died during the insurection. There is also an original copy of the Proclamation of the Irish Republic on desplay inside. In short, the General Post Office of Dublin is mainly known for two reasons: its architecture, and its historical significance which made it a symbol of Irland. It is definitely one of the highlights of Dublin.